First of all I want to congratulate our monthly giveaway contest winner,Mohan Ivt from India. Mohan won $100 in Bitcoins (there was an option between this and a ticket to Inside Bitcoins – link to transaction). I’ll be running a new giveaway next month so stay tuned. As 2014 comes to an end I thought I’d take a moment and analyse what Bitcoiners are feeling regarding their price predictions in 2015. If you remember, back in September I’ve asked people to try and predict what would be Bitcoin’s price on March 21st 2015. I’ve gotten an amazing response to this survey and almost 1,800 people have filled it out anonymously until today. You can see the results for yourself here. Although Bitcoin has been getting some very positive press lately (e.g. Microsoft adding Bitcoin payments, Time INC. accepting Bitcoin etc. ), but the exchange rate seems to be steadily declining. I’m not sure this is necessarily a bad thing as this separates the opportunists and “gamblers” from the actual Bitcoin advocates and gives a much more realistic reflection of Bitcoin’s price. I took a look at the average number I got for Bitcoin’s price prediction as time went by and noticed that there was a very clear downtrend in the results. Keep in mind that I excluded any results that were “off the charts” like $100K etc. As you can see the average prediction went from a little over $2000 to somewhere around $1750 (12.5% decline). I then decided to also check the median. The result was pretty much the same. 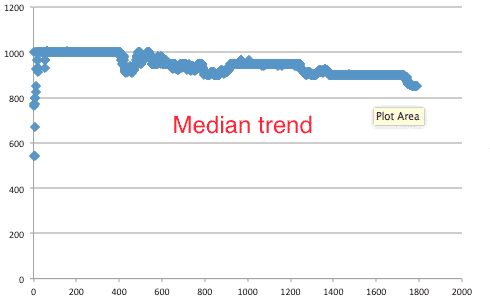 The median prediction went from being around $1000 to $850 – a 15% decline. Interestingly enough most people still think Bitcoin’s price will be higher than what it is today, but this may be due to the fact that most people who are filling out this survey are already involved with Bitcoin or have a certain interest in it succeeding. And the median prediction was going to go even lower than $850 if more people voted. I don’t think the price will go over $600 next year. I think it will be 1-2 years until these fluctuations will reduce and we won’t pay $300 for a Bitcoin now and a few months later $600. Just the fact that Microsoft has added Bitcoin payments should make the price go up. I think if more than 5000 people voted we would get a relatively accurate pricing for next year. I saw this documentary where it was proven that a large mass of people can predict these sorts of things. 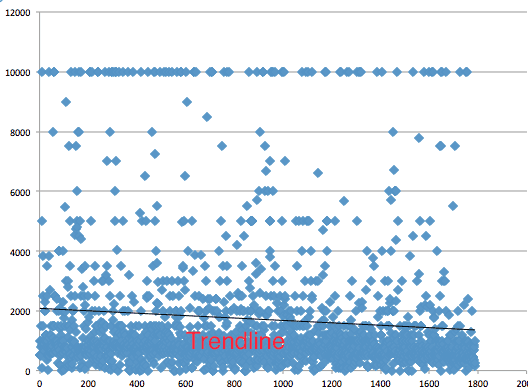 It’s quite interesting that there was a downtrend as time went by. If you would have asked me I would have said the price predictions would go up because of what happened in the market. I think the price will go over $500 next year.